The Compact VegTrug Patio Garden lets you garden at an easy working height; no bending or kneeling to plant, tend and harvest. The compact size is ideal for smaller spaces, and the elevated bed means no weeds and fewer pests, too. The V-shape makes efficient use of space and planting mix - grow deep-rooted plants like tomatoes in the center, shallow-rooted crops along the edges. Includes a fitted fabric liner to keep soil contained while letting excess water drain. Plastic feet protect wood from wet surfaces. Easy assembly.The Compact VegTrug Set includes the Compact Vegtrug Frame and Greenhouse Cover. You can start planting earlier in spring and extend the growing season later into fall for an even bigger harvest. 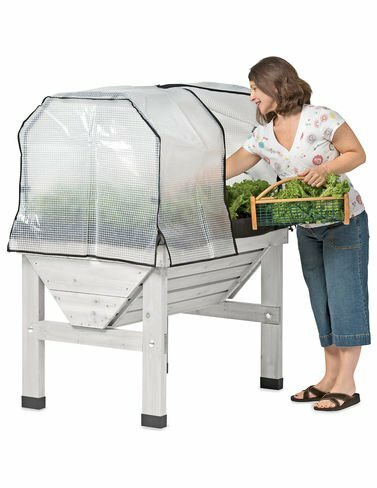 The easy-to-install, 21"-high steel frame installs in minutes with convenient push-fit connectors, and the reinforced polyethylene greenhouse cover has heavy-duty stitching and zippers. The cover slips snugly over the frame and attaches with strong VELCRO® brand tabs. Zips open for ventilation and easy access to crops.The set also includes the FREE polyethylene micro-mesh Compact VegTrug Insect Cover to protect plants from insects, birds, harsh winds and hungry deer. To install, simply remove the greenhouse cover from the frame, and then install the insect cover in its place. Attaches with strong VELCRO® brand tabs. Zips open for ventilation and easy access to crops.